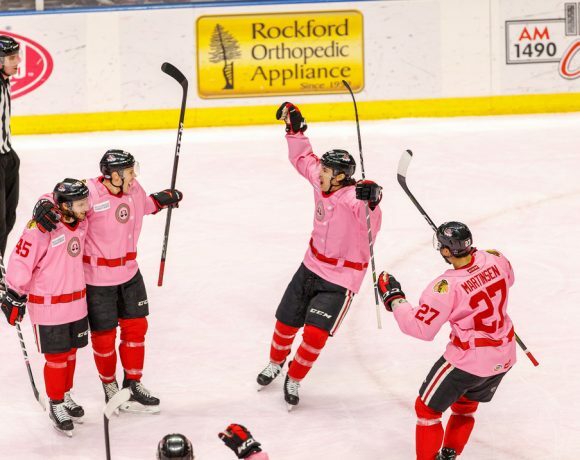 The Rockford IceHogs hit the weekend in search of points. Points on the scoreboard and points in the AHL standings. Entering a big three-games in three days stretch, the IceHogs are staring at two of the better teams in the Central Division. Rockford did post wins over the Chicago Wolves and Milwaukee Admirals two weeks ago. The problem is that they haven’t won since. The IceHogs are in sixth place in the Central Division standings with a .526 points percentage. Texas (.533) and Grand Rapids (.531) sit right above Rockford. It’s not hard to pinpoint a reason for the Hogs four-game losing streak. There’s a power outage on the offensive end. The last four games of Rockford’s road trip yielded just five goals. The only multi-goal game in that span did get them a point Tuesday in San Antonio, though the IceHogs lost that game in a shootout. Right now, goal-tending is not a problem for the piglets. Anton Forsberg, who looks set to return from an illness, and Collin Delia have been excellent. Delia, in particular, has felt the pinch of the goal shortage. In his last seven starts, the Cucamonga Kid has posted a 2.22 goals against average and a .941 save percentage. His record in those starts is 1-3-0-3. The Hogs are currently 30th out of 31 AHL teams in scoring with just 2.47 goals per contest. The team below them, San Antonio, just beat Rockford twice to close out the road trip. The IceHogs are also 30th in the league in shots at 26.79 per game. Why the drought? Simple. Matthew Highmore (24 goals last season) is out for possibly the season following shoulder surgery. Tyler Sikura (23 goals last season) has been out of the lineup the last five games. Rockford was missing a veteran scorer in Jordan Schroeder for nine games until he returned this past weekend. Terry Broadhurst, another veteran, has been out the last six games. Having your top scorers out is going to put a dent in the offensive output. Rockford is a team of prospects. The organization, as is usually the case, did not go out and stock the roster with AHL scorers this summer. When four big point-producers miss time, it’s hard to replace them on the score sheet. Dylan Sikura (6 G, 8 A) and Darren Raddysh (4 G, 8 A), along with Anthony Louis (7 G, 4 A) pace the Hogs in scoring. However, Rockford does not have a player in the top twenty of the league in goals or the top forty in scoring. It seems unlikely that the Blackhawks are going to obtain veteran scoring help in the immediate future. Rockford is going to have to get healthy, then get after it in the offensive zone to turn its fortunes. 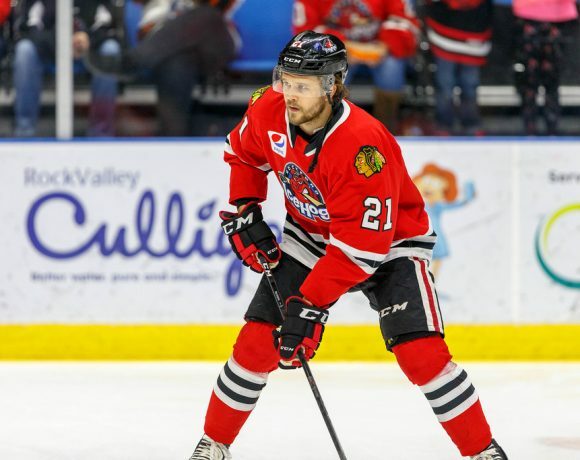 Thursday, the IceHogs assigned two players to the Indy Fuel of the ECHL. One was forward Brett Welychka, who had been in Rockford since October 29. Welychka played eight games but hadn’t recorded a point. Also going to Indianapolis is goalie Kevin Lankinen. 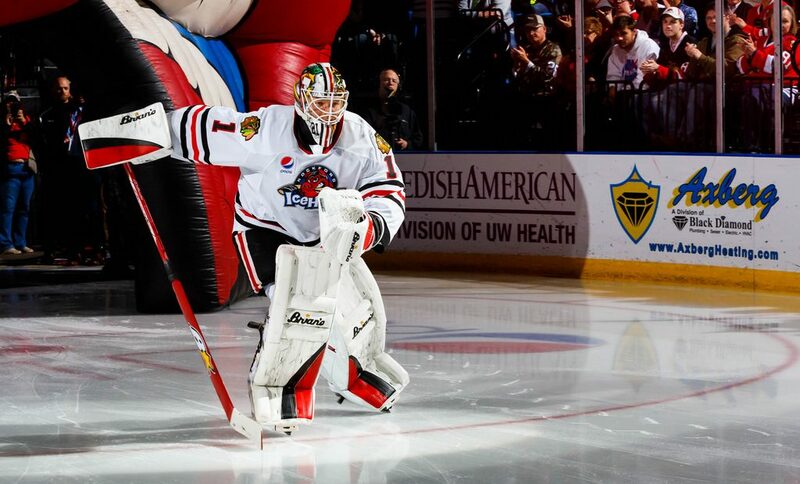 The rookie from Finland had a nice game in net for the IceHogs Saturday night in San Antonio despite being hung with the loss. 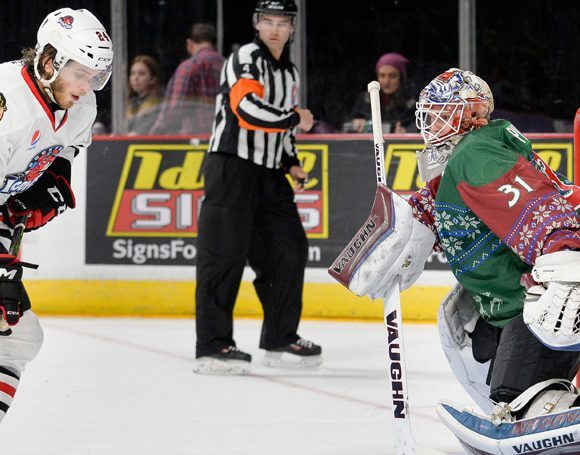 These moves suggest that goalie Anton Forsberg and second-year forward Tyler Sikura may be ready to rejoin the lineup. Sikura would be a particularly welcome addition in light of Rockford’s offensive woes. Collin Delia recorded 36 saves to give the Hogs a chance to break the losing streak. However, an early two-goal lead went for naught and the Rampage prevailed on penalty shots. It didn’t take long for the IceHogs to build that two-goal advantage. Dylan Sikura took a pass from Graham Knott into the Rampage zone, maneuvered his way into some open ice and fired past San Antonio goalie Jordan Binnington at 3:06 for a 1-0 Rockford lead. Later in the fourth minute, Anthony Louis took a cross-ice pass from Jordan Schroeder and sent an offering over Binnington’s shoulder and into the cage. 3:54 into the game, the Hogs led 2-0. With Andrew Campbell in the penalty box for tripping, San Antonio cut into the lead with a power play goal. Jakub Jerabeck sent a shot toward goal that glanced off of the stick of defenseman Lucas Carlsson and found its way past Hogs goalie Collin Delia. The goal came at the 18:10 mark; the teams skated to the locker room with Rockford leading 2-1. A turnover by Carl Dahlstrom set up the Rampage with a 2-on-1 rush in the Hogs zone. San Antonio tied the game when Jordan Kyrou passed to Charlie Sampair at the left post. Delia never had a chance and it was 2-2 8:52 into the middle frame. Both Binnington and Delia stood tall in the third period as well as in overtime. The shootout started badly for Rockford as Austin Poganski and Kyrou scored on their attempts. Louis converted in the second round for the Hogs after Viktor Ejdsell was denied. Delia stopped Joey LeLeggia, but Binnington did the same to Sikura to close out the contest. The IceHogs touch down briefly at the BMO after a six-game road trip with a game with Chicago Friday. The Wolves are tied with Milwaukee for second place in the division. Chicago will be missing Daniel Carr (9 G, 13 A), who was recalled to Las Vegas Thursday. Thomas Hyka (15 G, 33 A last season) comes down to join the Wolves. Brandon Pirri (7 G, 13 A) has been hot of late for Chicago, with a four-game point streak. He has three goals in his last two games. Rockford visits Milwaukee Saturday night before going to Chicago Sunday afternoon. The Admirals got Rocco Grimaldi (4 G, 7 A) back this week after a month in Nashville. Milwaukee is led by defenseman Matt Donovan, who has eight goals and eight apples so far this season. Follow me @JonFromi on twitter for updates between periods tonight at the BMO and thoughts on the IceHogs all season long.